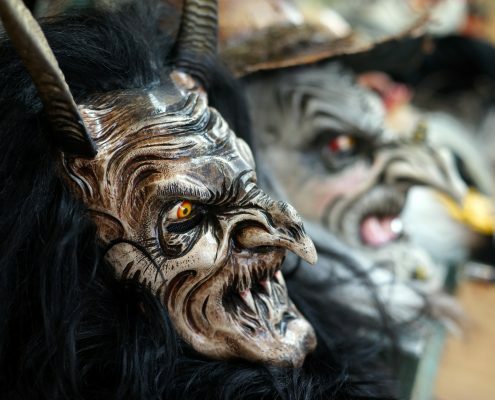 Each winter the residents of the Tyrolean region of Austria, Bavaria, northern Italy, and parts of Switzerland celebrate Krampuslauf (Germany) or Perchtenlauf (Austria). The ceremony originated in ancient pagan ritual worshiping nature spirits during winter solstice and harvest festivals, and was forbidden by the Catholic Church, but the tradition continued secretly and the Church accommodated it by syncretically merging it with Catholic ideology in the late 16th century. Since that time, on St. Nicholas Eve, December 5, St. Nicholas, dressed as a white-bearded bishop, parades through the streets promising gifts to good children. He is accompanied by Krampus, a hairy demonic figure with a long tongue who stuffs naughty children in his basket and carries them to his lair to eat. The German name comes from the word Krampen, meaning claws. A modern Krampus mask in Graz, with realistic features and a gruesome effect, December 2014. 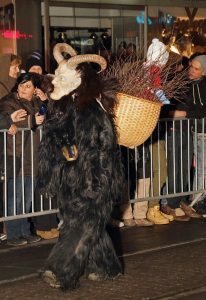 In many towns, such as Graz, Austria, the Krampuslauf takes the form of a parade, and in modern times the Krampus greatly outnumber the St. Nicholases. They carry switches made of birch sticks (or sometimes horse tail) to whip naughty (more accurately, random) children in the crowd, perform scary antics, and clown with witches. The Krampus costume consists of leather boots, a full body suit of goat leather and fur, leather boots, leather or goat fur gloves, and leather belts with giant bells to make noise as the Krampus walks. 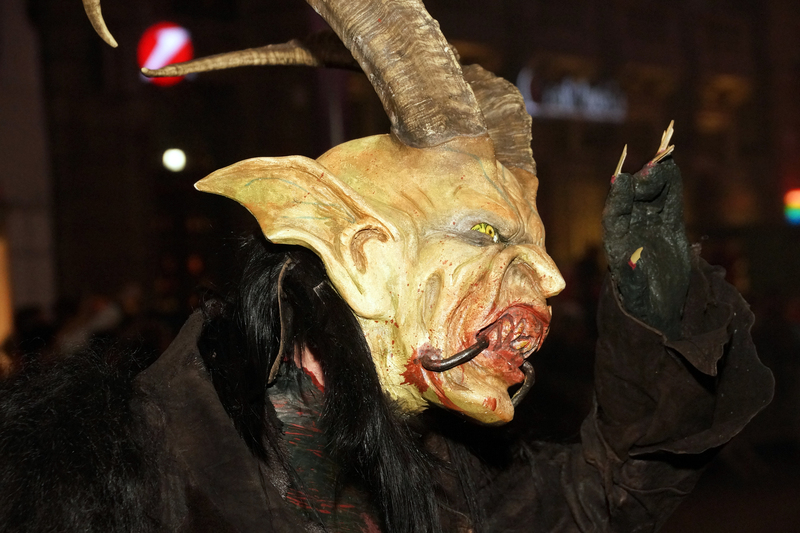 LED illuminated eyes are a common feature of modern masks, like this one in the Graz Krampuslauf, 2014. The mask is traditionally a wood helmet mask with sharp teeth and a terrifying expression, a lolling tongue, and horns from the steinbock, an Alpine mountain goat, although cheaper domestic goat horns are more common. In the past, the Krampus sometimes had a comical expression, but in modern times realism has triumphed. The mask’s face is even frequently lacerated and bloody, and sometimes LED lights are incorporated to make the eyes glow. Although Krampus is a male figure, young women have increasingly participated with female versions of the costume and mask, which are technically the Perchta, a female version of a character similar to Krampus but having a different origin. This Krampus has a traditional basket on the back with a doll posing as a naughty child being carried to be eaten. Graz, December 2014. In some towns in the region, different and older traditions prevail. 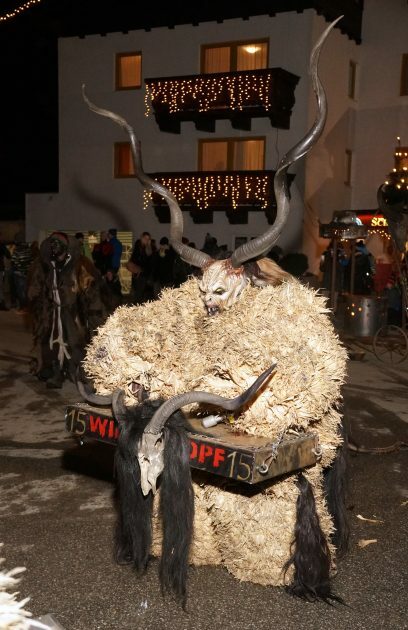 In the small town of Bad Häring, Austria, for example, instead of a parade of Krampus in goat fur suits, the Krampus wear thick plant fiber suits with enormous bells or drums. They gather around a lead Krampus who tends a mystical fire and directs them while they drum in a circle around the fire. Sometimes the lead Krampus is accompanied by a witch (Hexe), but St. Nicholas makes no appearance in Bad Häring. 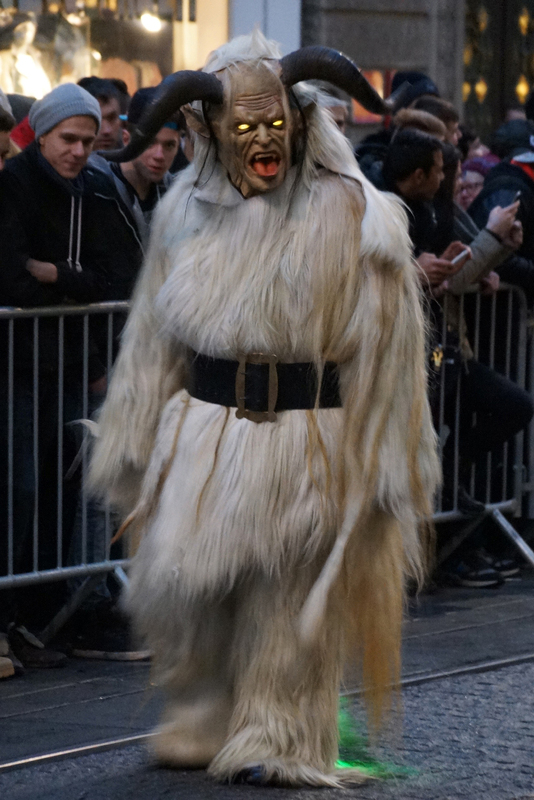 The Krampus tradition has become so popular that it has spread beyond its traditional roots to some towns in eastern Switzerland, where it is called Schmutzli, as well as the Czech Republic, Hungary, northern Italy, Slovenia, and even the United States, where Krampuslaufen are periodically held in Los Angeles, Philadelphia, and Bloomington, Indiana. Krampus masks for rent to Krampus guilds in the workshop of Sepp Seidl in Sankt Veit im Pongau, Austria. 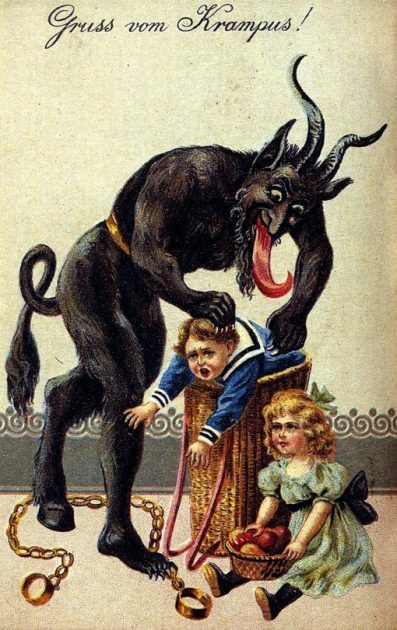 A German greeting card from around 1900 shows Krampus stuffing a naughty child into his basket. 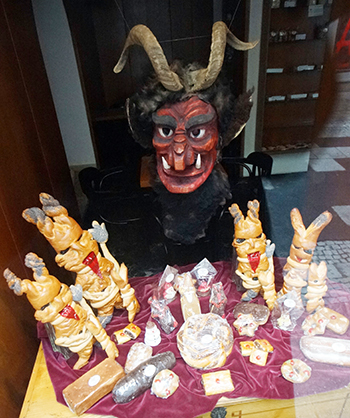 Krampus-themed pastries offered at the Edegger-Tax Bakery in Graz, Austria, 2014. 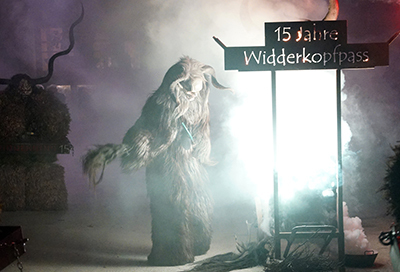 A Krampus “Widderkopf” drummer at the celebration in Bad Häring, Austria, 2014. The lead Krampus tends the fire at Bad Häring, Austria, December 2014.